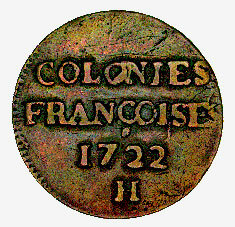 The copper coin illustrated is one of a colonial issue that the Company of the Indies, a private French trading company, imported into New France under the authorization of Louis XV. The colonists, however, were reluctant to use the new coinage because of their previous experience with depreciation of copper coins. In view of the difficulties in getting thc issue accepted, the Company asked the government of New France to assume responsibility for its circulation. Negotiations dragged on, and the bulk of the coins remained in company storage. When, in 1724, all French copper coins were reduced in value by a third of their intrinsic worth, the colonists rejected them totally. Two years later, the unissued copper pieces that remained at Quebec were returned to France. This issue was not struck exclusively for Canada but was sent to the other colonies in the New World as well. In Louisiana, thc authorities were unable to keep the issue in circulation despite threats of imprisonment for anyone refusing the coins. The letter H on the coin below the date indicates that this piece was struck at the mint in La Rochelle, France. The coin, slightly larger than a twenty-five cent piece, is part of the National Currency Collection, Bank of Canada.